Knee replacement surgery has become the most common elective surgery performed in the U.S. on an annual basis. There are an estimated 600,000 procedures performed each year. While an orthopedic surgeon may perform multiple operations in a single day, when he or she finds out they need to have a total knee replacement procedure performed on them personally, it is a very new experience. A recent news feature from Medscape involves a very experienced knee replacement surgeon discussing his own total knee replacement surgery and recovery. This surgeon is 59-years-old and has been performing knee replacement operations for quite some time. He estimates that he performed more than 3,500 total knee replacements over the course of his career. It would seem that the procedure is entirely routine, but that is only the case when he is operating on other people. He has said that he has had a certain amount of pain in his knee for as long as he could remember. The pain has gotten the point where he decided to undergo the procedure himself. He knows many well-qualified total knee replacement surgeons and chose someone with whom is very familiar. He said that the if everything goes well, a skilled surgeon should be able to perform a total knee replacement in less than one hour. While it is not a race, the faster a surgeon works, the less time a patient spends under the anesthesia, and that makes things much safer. Since operating rooms are at a premium and the hospital makes money on each procedure, it is also good business to do as many surgeries as possible, and many hospitals, even non profits, are concerned about revenue. 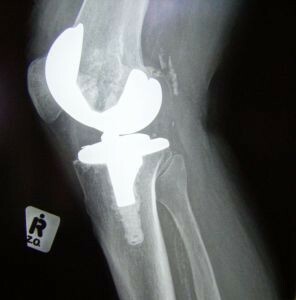 It should be noted that while most surgeons have performed many total knee replacement procedures and are very skilled, there is little chance of the patient having a successful outcome if the artificial knee device itself is defective. As our Boston knee replacement injury lawyers have seen in many cases, medical device companies are interested in getting their new artificial joints on the market so they can turn a profit. The Food and Drug Administration (FDA) has loopholes that allow the company to get their devices on the market faster if there is already a similar device on the market, and they take advantage of this loophole even at the expense of patients’ pain and suffering. This particular doctor is worried about chances he will not have a successful outcome. He says that despite the skill of the doctor, around three percent will have problems with their new knee, and that is when the device was designed properly. If the device itself is defective, there is very little chance of a successful result. It Is not only the artificial knees that have been defectively designed. These companies also make devices that are used to assist surgeons during the procedure, such as cutting guides. We have seen one company known as Otis Med, now owned by Stryker, ship a cutting guide after the FDA specifically told them not to do so because it failed to be approved. One company executive shipped it anyway, and he was sentenced to time in federal prison.